This gets a rare one star rating from me. Alice Love is eating lunch with a friend when her credit card is declined. She figures it's just a mix up with the bank as she's had trouble with that card before. She goes online to check her account and is stunned to find out that her account is in overdraft. It turns out that her so called good friend Ella, has stolen her identity. The banks tell Alice there isn't a lot they can do for her, but her brother in law Stefan who is married to her step sister Flora, has connections and hires Nathan, a cute American to help Alice track down Ella. 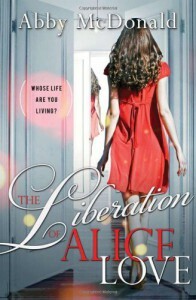 The Liberation of Alice Love was a hard book for me to get through. I just had a hard time connecting with Alice and some of her actions. To find out where Ella went, and how she did what she did, Alice starts going through each receipt shown on her account and visits every step that Ella took while pretending to be her. She finds out more information then the banks and Nathan do. When Alice discovers that her money was given to charity she feels justified in being friends with Ella because she did something good with the stolen money instead of using it for selfish reasons. Alice then goes on to do everything that Ella did with her money, and while she was supposed to be discovering herself I felt like she was just doing what Ella did. I love British chick lit, but just couldn't like this one more. The first half of this book was so boring I lost track of the number of times I almost gave up on it. However, the second half becomes much more likable and some action finally starts happening. Alice's sister Flora, becomes much more a part of the story and saves the book from only being about Alice. There is one line that mentions Jane Austen's Pride and Prejudice and Flora comments that Alice is a lot like Elizabeth Bennet. Once I read that line, I couldn't help but re-evaluate all the story to see if the characters related to the ones in P/P and it made me like the book a bit more.